Today was the first lesson of the Sitting Pretty Mystery Class featuring the super cute cat canvas from cbk. You know I like to try to keep you guessing as to what I will do with the canvas. 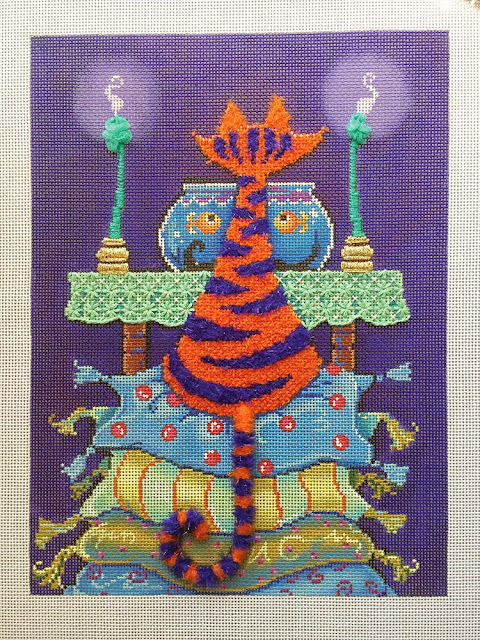 What no one saw coming in this lesson is that I didn’t stitch the background first! Hah! Gotcha with that one. I almost always do the background first, but this time I had other plans. 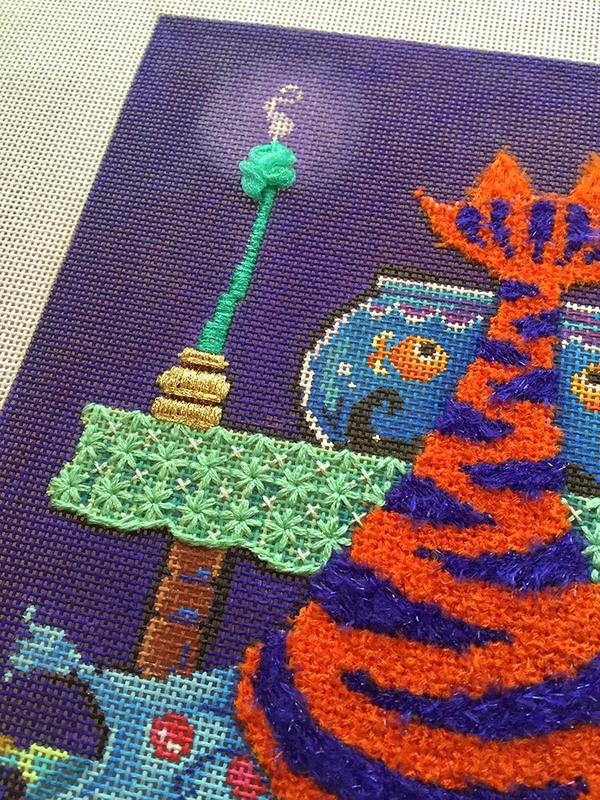 I really, really wanted to stitch the cat first. I wanted him to be fuzzy and fun. He is orange and purple striped after all. His tail is worked in the repousse technique. This is what everyone did in class today. It was challenging and different. It’s not really hard, just different. It uses different parts of your brain. We all agreed at the end of class it was well worth the effort. You begin by attaching several lengths of perle cotton and memory thread to your canvas. You need lots of thread hanging on the front of your canvas. Next you anchor your wrapping thread under the tail. 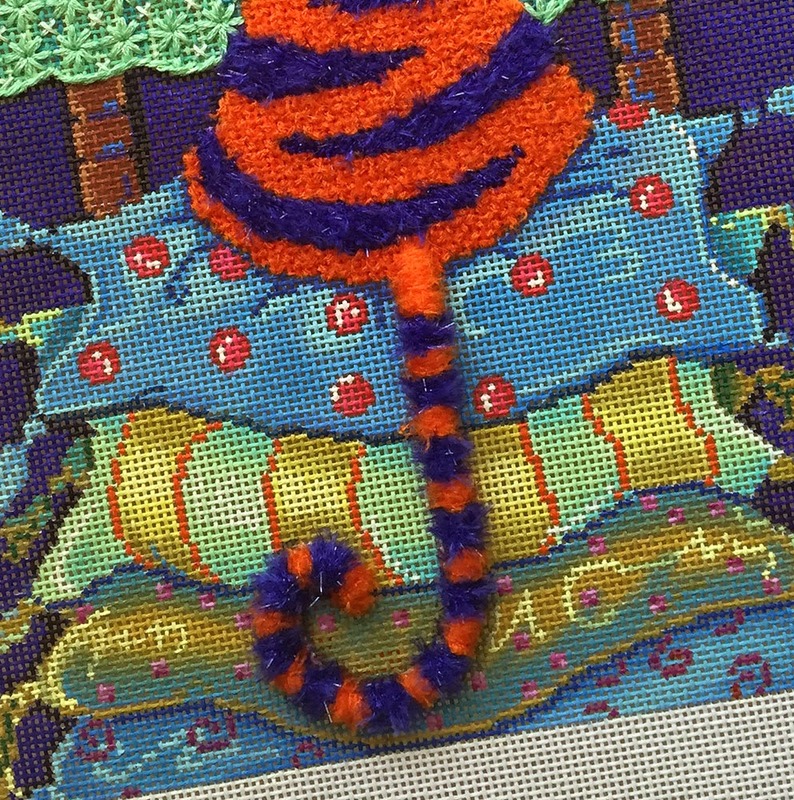 You need to keep all the thread on the front of the canvas; you are just sinking the tails of the thread enough to secure them. Now you wrap! This is the card trick; don’t cut the thread from the cards, just start moving the cards around and around the cords wrapping stripes down the length of the tail. Repeat with the second color. Once the wrapping is complete, sink the ends of the cords etc at the tip of the cat’s tail. Tack in place and secure everything on the reverse. Voilá super fluffy, cool tail. Everyone’s tail is a little different. Mine essentially matches what was painted. Others wrapped more allowing for a little extra curve at the tip. Every tail looked adorable! The rest of the cat is pretty straightforward. Just the magic of great threads. The table cloth is lacy and sweet and check out the candle sticks. The magic of Petite Frosty Rays creates the perfect candle drips. Since this was the first class of a new mystery, I had the fun of unveiling the matching limited edition snap tray and the matching scissor fob. You know I love my accessories. Two weeks until the next class. More fun is planned. See you then. 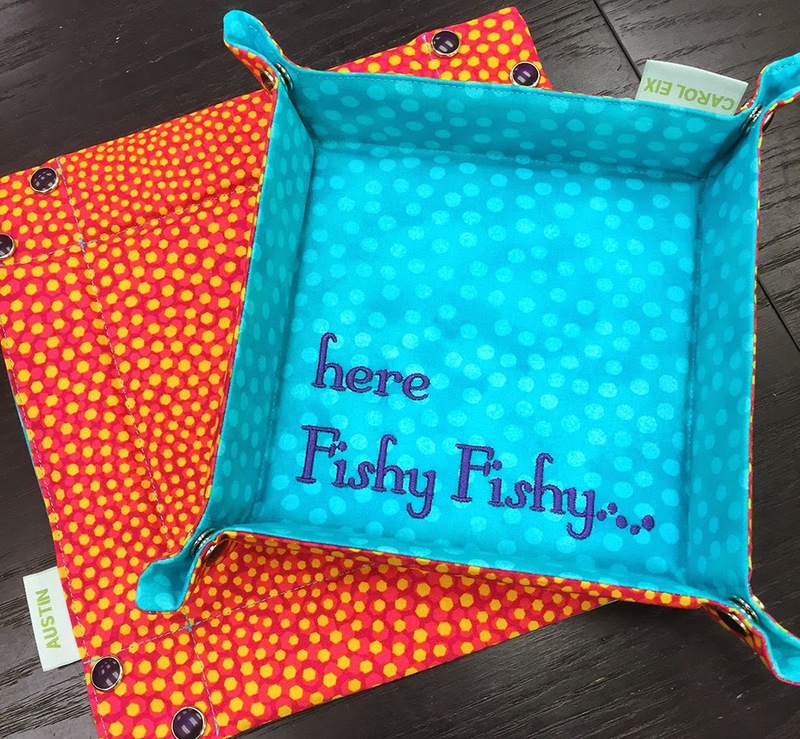 Hi – You can order the canvas, guide and threads at http://www.bedeckedandbeadazzled.com/Sitting-Pretty/ or you can call us at 410.296.0405 and we'll take your order and send you a kit.